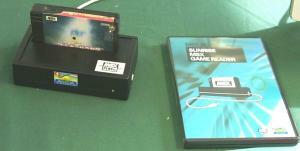 Sunrise MSX Game ReaderOne of the first USB cartridge readers called the "MSX Game Reader" from Japan, is currently available (also under the Sunrise USB-GAMEREADER name as an alternate English supplier), and essentially allows you to play real MSX cartridges on a standard Windows XP PC. The product comes with the MSXPLAYer, which does a good job with emulation. However, the latest version of the freeware blueMSX, 2.6, now supports the device as well. This is great news for those who want the MSX experience without having to maintain an MSX computer or even multiple systems for maximum compatibility (MSX 1, MSX2, Turbo-R, etc. ), so the more options, the better (I only have a Sony HB-F1XD MSX2 computer myself). It's unfortunate then that the hardware is so relatively expensive, but perhaps this will inspire others to implement related technology for other classic systems as well.